I'm running a bit late for my post this morning and that's because I failed creatively last night. 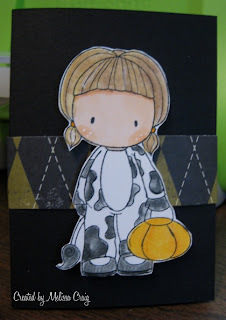 Oh well, I still have a pretty card to show you that I made for my Monthly Card Swap. Marji provided the gorgeous paper and the pretty tree. The challenge was to create a tall card. I find that I do love long cards but they are rather difficult to photograph. I colored the tree with Prismacolor markers and I provided the striped paper and the base of Always Artichoke. 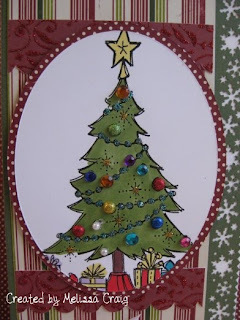 The polka dot paper under the tree is the other side of the striped paper which is from Making Memories. I love this paper! Here's a close-up of the tree with all it's pretty ornaments. Marji sent along some very pretty brads and I added only a few of those and filled in with some other bling, as well as some stickles. No, I am not ready for Christmas yet, but I guess I should start thinking about it. OK I'm off the computer and to my craft table. I hope you all have a wonderful day. Have a safe and fun Halloween and don't forget to set your clocks back an hour. 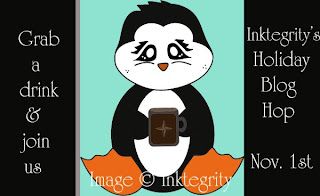 And we'll see you back here on Sunday for the Inktegrity Holiday blog hop. It's going to be so much fun! Good Morning! I am so excited about Lindsay's new stamp set! It's so wonderful. It's called Doodle Flowers and it's available here at Lindsay's Shop Handmade Store. I decided this flower was screaming to be paper pieced. I had so much fun putting this together. It comes with this really fun circle sentiment. 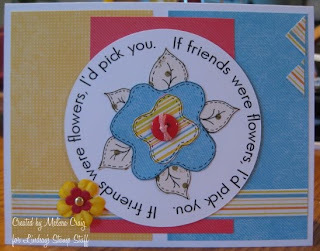 I used it in .png format so that I could layer the flower inside the sentiment and then printed the base and cut it out using a circle cutter. Then I deleted the sentiment from my word document and printed the flower on 3 different papers, cut the pieces out and glued to the base. 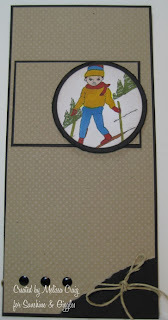 (I have a tutorial on digi-stamp paper piecing here.) Instead of another piece of paper for the button (which does print out on the flower) I opted for a real button for more added dimension. And yes of course, I followed a few challenges. The sketch I got from iheart2stamp. I did flip it a little. 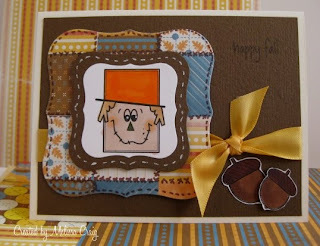 Crazy4Challenges said to use geometric shapes, so my card contains circles, rectangles and little triangles. Just Us Girls said to add a 3D flower. I failed at the attempt to make the pretty tissue paper flower that they have featured, so I used a couple of primas layered and pop-dotted. I also want to share my final Halloween project. This is what I made for the Halloween Costume Party I am having on my Tuesday Morning Sketches challenge blog and since I featured Lindsay's images, it's perfect to share today! Thank you for stopping by today! Please be sure to visit Lindsay and the rest of the team. And if you haven't heard, Lindsay has an open Design Team call for Designers and Guest Designers. It's a really fun team to be on and I'm very thankful to work with some very amazing and wonderfully talented people! Oh - one more thing! Starting today, Halloween sets are on sale at MyGrafico. 30% off!! So if you haven't scored Lindsay's crows or other Halloween images you can do that, too!! I love this set by Mujka and you can find it here at the MyGrafico store. It's a Mix and Match Stems set and I think the silhouette images are stunning! There are line flower images and you'll see that Team A did a fabulous job with them!! Wow - they are awesome! 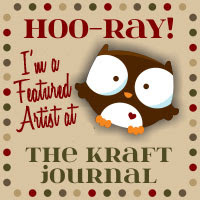 I hope you join us - I look forward to seeing what you create! I hope you're all doing well. It's cloudy and rainy today - typical Fall weather I guess. 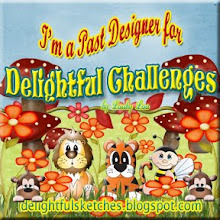 I'd like to invite you over to my challenge blog - Tuesday Morning Sketches. I have Halloween Party going on over there and I'm sure you'll have some fun. 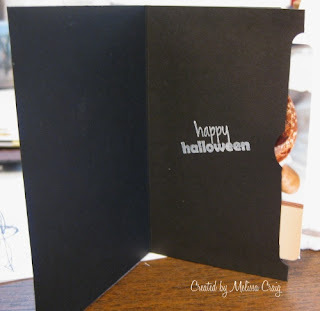 What I have to share with doesn't quite fit the theme of altering something for the party, but it's a really cute card that I followed the tutorial on Dawn's You Tube channel for a gift card holder. You can find it here. I made this to send in a Halloween Goodies swap but it turned out so cute that I wanted to share it with you before I mailed it off. This is a really simple little card. It measures 3 x 4 1/4 finished and has a belly band to keep it closed. 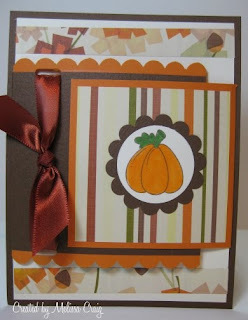 The image is from CC Designs from the Fall Kit that my sister had sent me. I love these stamps and soon it'll be time to put them away and break out the new Winter stamps that I just got yesterday. Anyway, she's colored with Prismacolor Pencils and OMS. I did use Copic markers for her face. Here's the inside view and I'm not quite sure why the picture looks like this, I did fix it and it looked fine a minute ago. Oh well, you can see where I tucked the card into the middle portion that is created and a simple stamped sentiment. Thanks for stopping by and I hope to see you over at the TMS Halloween Costume party. OK - My Monday isn't starting off very sunshiny. Hollyanne is home today with a sore throat today... I wasn't able to work on my Sunshine Monday card until after the boys left for school (which is good because I'm able to participate in a couple of Monday challenges)... and I finish my card pretty quickly but the camera battery just died! So... here's a scan of my card and I will take and post a better picture when it's all charged up. Ugh! This looks awful. I don't like scans! Sorry about that friends. I promise I will post a better picture as quickly as possible. Edit to add photo. Hmmm... not sure it looks any better. 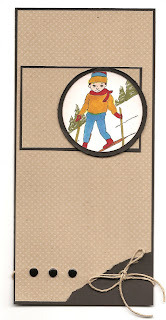 I did use the new Skier stamp from Sunshine & Giggles new winter line. I'm not a skier, although a native Coloradan where the skiing is some of the best around, but this little guy looks like he's having no difficulty at all. He probably doesn't even have to do the bunny trails. The challenges I participated in are: TechnoStamper (the sketch) and The Pink Elephant (black, hardware & distressed). It really is very cute and very masculine - I'm not linking up until I have a better photo. Thank you for stopping by! Have a Sunshiney Monday with lots of giggles! (corny - heehee) Don't forget to stop by Janice's blog and the rest of the team. They are all linked in my sidebar. Hello! Thank you for stopping by. I don't know that I say that often enough, but I really do appreciate your visits. 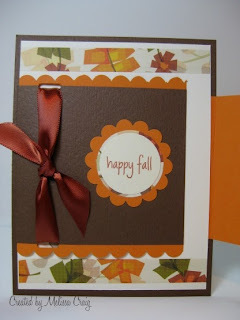 I have a quick post today to share a card I made for the new All That Scraps Challenge blog. You all know how much I love love love Christine's stamps and you know how much I love to play along with challenges, so I couldn't pass this one up. The challenge was to create a tall card. I've noticed that they have been so popular lately. They are fun to do - a bigger canvas to paint. The image is a new member to the Pixie family, her name is Birgitta. This is one of the many reasons why I love digi-stamps. You can re-size digi's to any size you need for your project. I super sized Birgitta - she's approximately 5 inches tall from head to toe. I colored her with Copics, Prismacolor marker (just one) and highlighted with a white gel pen. Her wings have coarse MS diamond glitter on them. 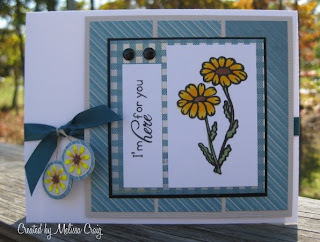 I created the additional sunflowers from scallop Nesties dies and circle punches. The sentiment is created from a stamp out of the PTI Boxes, Bags & Tags set and the actual sentiment is from Scrappy Cat Summer set. Please be sure to click on the photo so that you can see her pretty face a little closer up. Thanks for stopping by. Have a super weekend. For my son... GO PATRIOTS!! Good Morning Everyone! Happy Friday!! The mug actually has a fine dotted line in the center that can be paper pieced or colored to appear like a glass mug with a drink inside. I chose to cut along the dotted line to reveal a window. First off, I followed the tutorial for the Mini-Pizza Box on SCS and before gluing it together I created and cut the layers... one layer at a time. Then I punched out two circles of white card stock to form my snowman. I used scraps of the decorative paper to create his scarf. Click on the photo to enlarge it, you'll see that I even cut fringe on the ends of the scarf. I free-handed the hat and added the trim. I added the details to face with Copics. 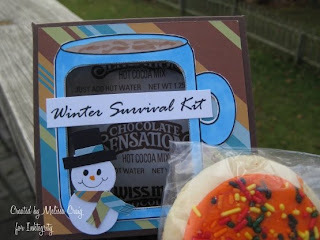 On the inside of this Winter Survival kit I added a packet of hot chocolate mix and a yummy sugar cookie. I hope you enjoyed my little project. Now go visit Joni to get this great download and have some fun with it. Have a super weekend! Good Morning Everyone! It's been gorgeous weather here in WV - true fall weather. I have a really neat project to share with you. I know you all have seen these stair step cards before and I've been wanting to make one, so I finally got brave and did it. 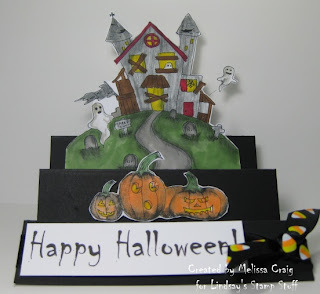 This features the Haunted House and Spooky Pumpkins from Lindsay's Stamp Stuff. I should've staged this better to get a better photo, but I ran out of ideas late last night when I finally had time to get this put together. But I guess it's showing pretty well. I created the sentiment using the standard Chiller font and I've had this candy corn ribbon for forever and finally got to use it! The Spooky Pumpkins I colored with Prismacolor Pencils and OMS. The Haunted House I colored with Copics first and then went back over it with a black Prismacolor Pencil and OMS to give the ominous shadows. I made the ghost float with a bit of fine wire taken from some wire-edged ribbon. This is going to look so cute on a teacher's desk for a little festive decoration. 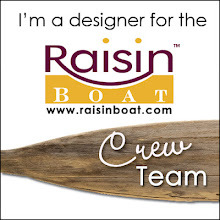 Hollyanne got to be honorary Junior Design Team Member - or better known as the Mommy & Me blog post. My daughter has discovered white craft ink and had a blast! 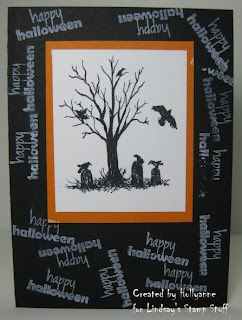 She used Lindsay's Crow Tree image to create this fairly CAS card. Please be sure to visit Lindsay and the team (linked in my sidebar) to see what wonderful eye candy they have to share with you. Thanks for stopping by. Good morning! I hope you're all well and having a great week so far. This is the 2nd part of the MyGrafico Challenge blog challenge. This week's set that is up for grabs is a fun vintage appliance set. Today's edition throws in a sketch to play along with the color challenge of red, turquoise and polka dots. And in my world, polka dots are color. Have fun! My images ended up being larger than I had planned but this was a fun and super easy card to put together. I the percolator pot reminds me of my Grandpa. I created the sentiment with a very fun font called Good Dog (dafont.com) and when I got this together my adorable black ribbon with white polka dots couldn't be seen. So with my trusty white gel pen I added dots everywhere else! I hope you join us with the challenge this week and every week! If you haven't visited the MyGrafico store lately, you really should - we have some great new artists and super deals! Hi All! Just a quick post here. 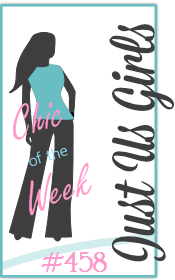 I am so pleased to announce that TMS is teaming up with There She Goes this week so be sure to head over to my challenge blog and join in the fun! Here's the card that I made using a couple of images from TSG Bloom set. I love this set!! 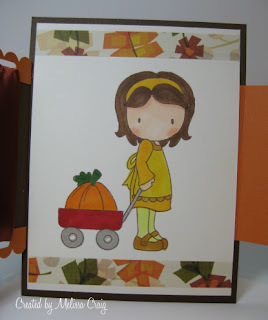 The paper I used is from the Recollections paper pack Autumn. This is such a fabulous shade of blue. I colored the image with Copics and added a couple of black metal buttons to fill the space that I left because I didn't measure right (and it was getting late). I found the perfect shade of ribbon in my big box and then added the dangling embellishments. 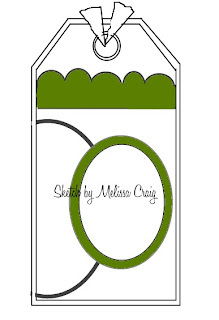 Here's my sketch and it would also look fantastic as a longer card, too. I hope that you join us. You have a couple of chances to win, too. My blog and the TSG blog are both offering prizes. I can't wait to see what you do. Good Morning All! It's the beginning of a new week. Levi gets his cast off later this morning and he's very excited about that! The parade went well, the girls were very brave to dance in the cold and rain and my feet are still sore. 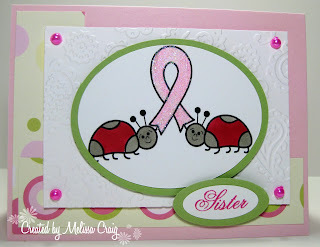 I have another new stamp to share with you from Sunshine & Giggles. I am NOT admitting the snow is coming but I guess it's the inevitable. 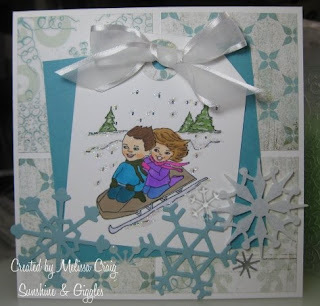 I also used a FABULOUS sketch from Friday Sketchers to create my card. I'm pretty happy with it. I had received these great snowflakes from a winter swap and I love them!! I couldn't get the swirly motion, but I like them anyway. The stamp is called Hang On! and you can find it and the rest of the winter release here. I colored them with Copics and then added "snow" with a white gel pen on the trees. Then did a final touch with dazzling diamonds glitter to create my favorite kind of snow - the kind that really looks like dazzling diamonds. I hope you enjoy my card. Thanks for stopping and enjoy your day! Good Morning! Welcome to my first slide show tutorial. I don't own a video camera... well, that's not completely true but let's just say this was the easiest for me. 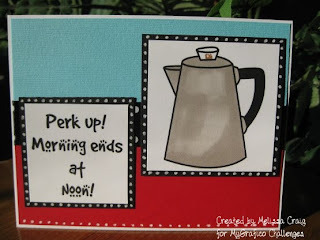 I wanted to share how to paper piece using digi-stamps. The key to this is to print all your pieces one right after another. That way you're sure to have the same size. At the very least save the document. I start off with importing my chosen image into a word document (I use Open Office) and size it there. Then start printing. For this one, I printed my base on Vanilla card stock and then chose the paper for the pumpkin, legs/arms and then finally the stem and then printed. I can't slow down the slideshow, but you can pause it. Hover your mouse over the images and the pause button will pop up. Here is my finished card. I had to laugh and there are couple who know me really well to know why I am laughing at my great big bow on the side. I won't go into detail, but it is funny. I hope you enjoyed my slide show. I am rather excited that I figured out how to do this in blogger. Whoo-hoo!! Thank you for stopping by and enjoy your day. Have a super weekend! Yesterday was so dreary and ugly out - I do hope today holds some sunshine! It's still too early to tell at this point though. You all know that Breast Cancer Awareness is something that is very near and dear to my heart, I've shared that we just celebrated by sister's second year of being cancer free. 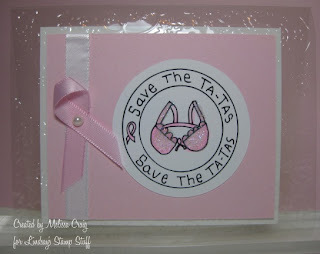 Since October is Breast Cancer Awareness month there are many companies that have created stamps to keep the awareness on the forefront. I've seen some adorable sets - one from Nutcrafters comes to mind called Pink Icing. Well, Lindsay has created a great set that is this week's freebie! All you have to do is go visit Lindsay's blog to get the download. I actually followed a couple of challenges but I can't link to them because I didn't use their products. 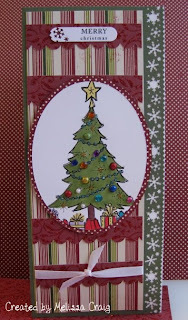 The first challenge is from All That Scraps which is to make a clear card. 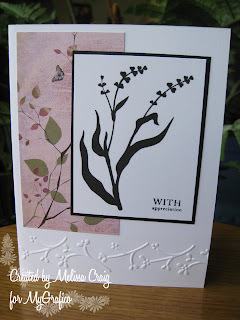 I also saw a fabulous idea on Stamp TV (I think) to emboss clear acetate. So I did. 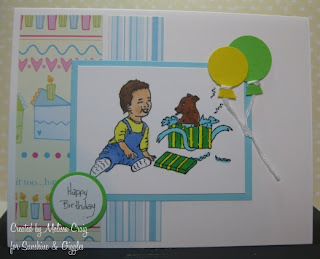 The second challenge is from Doodle Palace to create a celebration card and add glitter. 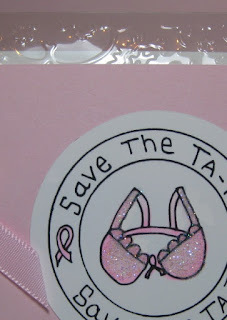 Well, Think Pink isn't just about awareness but it's a celebration of life! Here's a close up view where you can see that I glittered the bra and hopefully you can see where I embossed the acetate. I hope you enjoyed my card today. Thanks for stopping by and don't forget to visit the rest of the team - I know you're sure to enjoy their projects! And speaking of freebies, don't forget that Inktegrity still has the Awareness ladybugs up for grabs, too. You can find that here. Here's the card I made with that last week. Good Morning! How are you today? Thanks for stopping by. I have a fun project to share with you today. 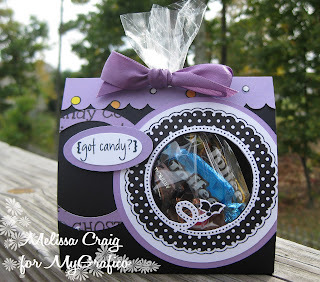 This is for the Wednesday Edition of the MyGrafico Challenge Blog challenge which is to create holiday tags. And there's a way fun tags set up for the prize. I created a sketch for this challenge, but the idea of the candy holder I found on You Tube, a Hero Arts video that you can see here. All the cut work isn't all that hard, just takes a little bit of time. Oh and actually the little bat is really a bee, I just did a little work with coloring with a fine tip black marker. So here's the sketch... I hope you play along. Good Morning. Happy Columbus Day. My kids are still asleep so I'm enjoying the quiet of the morning. Isn't he cute?! I think this image is so sweet and they are love at first sight... a boy and his new puppy. This image is called New Best Friends and is part of the new winter collection. There is still a few more days to get him and the other 9 stamps in the collection at half off. It's a great opportunity to save some money and help out a family, too. I did happen to play along with challenge, too. 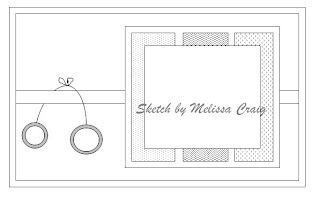 I used Sketch Saturday's sketch and it is a great one! So easy to use. Thanks for stopping by and enjoy your day! 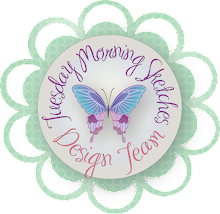 Be sure to visit Janice and the rest of the design team to see what they have to share with you. All are linked in my sidebar. Good Morning Everyone! I hope you're all doing well. Lindsay is releasing a new stamp set today. It's called Funky Forest Friends and I'm sure you'll recognize some of the stamps but she's added some new ones, too. 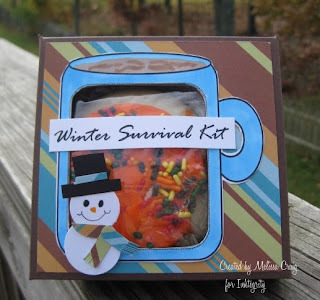 Be sure to check it out on Lindsay's blog and score the freebie she has to offer, too. I decided I wasn't feeling very foresty today - I went for one of my favorites... COFFEE. I remember in grade school we had an assembly of sorts where the whole school was in the auditorium and some guy was there teaching us these silly songs. One was about 'if at first you don't succeed...' but there was this other song that went (and these are the only words I remember) "C-O-F-F-E-E coffee is not the drink for me..." --What a ridiculous song! Of course when I got into high school I started drinking coffee. Anyway, so here's my song, I mean my card and I played with a couple of challenges along the way. First of all, the angle in which this photo was taken made it look like I was drinking something stronger than coffee - it's not really crooked. LOL The sketch I followed is from Crafts 4 Eternity. What a great CAS sketch! It also had a recipe to it (the sketch, a punch and a knot or a bow. I forgot the bow part.) 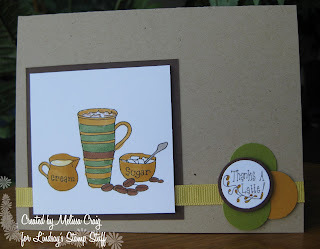 The colors came from Color Throwdown challenge: Kraft, Olive Green, Dark Brown and Dark Yellow. I colored the image with Copics and found a grosgrain ribbon in my stash that was a bit lighter than the Mustard color I used - but I thought it gave a nice contrast. Well, thanks for stopping by and joining my little sing-a-long today. Be sure to visit Lindsay and the rest of the team. I haven't even seen any little previews of what they might have so I'll be just as surprised as you will be. Have fun!